i like but the number 68 is the best....i think! THIS GUY LOOKS LIKE ME!! Hey man how do u describe how to cut it to the hair cutter? I aint no good with haircuts. All my past ones were BBAADD!!! So how would you say it. Like cut it how long and how think and stuff? how long do yu have to wait till yur bangs grow that long? Put a small ball like the end of ya finger in the middle of your hand, spread it all on both hands, and give a shape to ya hair. HOw do you get the hair to seperate in deferent blades and stay together like that ? gel? 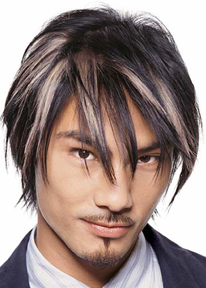 Awsome hair i want it...how do u get that white blonde colour aye? Wooow very nice hair and color style.